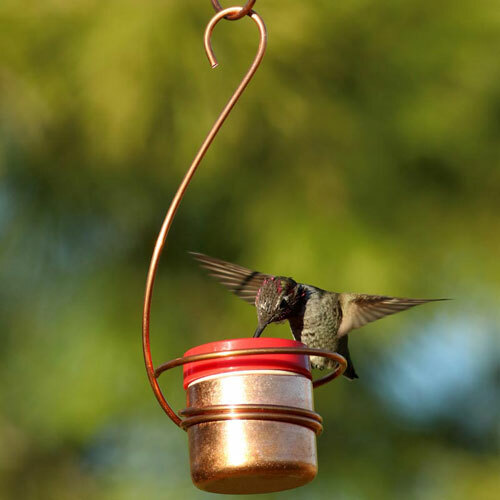 Designed by an ornithologist devoted to hummingbirds and their habitats, this unique and innovative hanging feeder was developed to resist the onslaught of bees to the sweet nectar it contains. 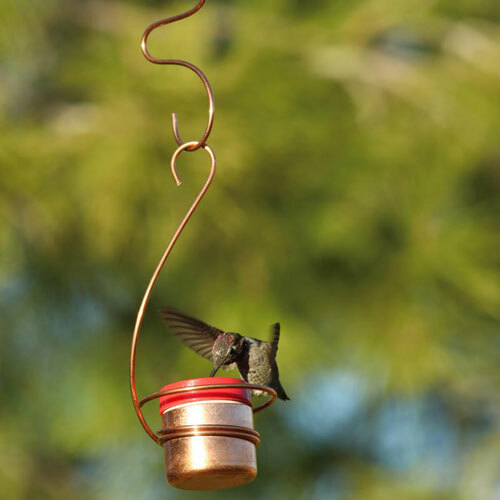 It features an easy-fill lid that fits hummingbird beaks perfectly, but is too small for bees to enter. Made of a sturdy, powder-coated metal finished with a sleek copper tone, it looks fabulous hanging from a tree, under the eaves or upon a shepherd's hook anywhere in the landscape. Includes two 1 oz. easy-clean feeding jars that fit snugly into the feeder. Made in the USA. 12"L x 3"W x 10"H Overall. Weighs 7 oz.